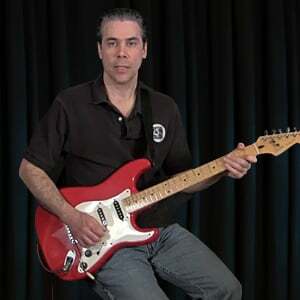 This tutorial is an introduction to Jazz style lead guitar. We'll cover the three primary characteristics of jazz as a distinct genre of music: sophisticated harmony, swing rhythm and improvisation. We'll learn how the essence of lead guitar in jazz style is "playing the changes". We'll learn how to build and play chord scales that follow the chords of a stereotypical jazz progression. We'll also learn how to build and play arpeggio lines that are based on the extended harmony chords typically found in a jazz tune. We'll learn to play these chord scale and arpeggio lines as licks using swing rhythms. Specifically, we'll be playing them in eighth note triplet swing rhythms. We'll learn to play these licks in two different octaves, we have two different registers (high and low) to pick from, so we have options to use in order to improvise. Finally, we'll have some backing track play alongs to test out our new jazz lead guitar licks! If you haven't already I encourage you to work through the Intro to Jazz Rhythm Guitar Style.